Take your time with this Reading as you will be compiling information that will then take time to analyse and assimilate. Do not expect it all to be spelled out to you clearly and precisely. Like all Tarot Readings you will have to call on your intuition, imagination and powers of reasoning and deduction to formulate a story and running order of events. It is up to you to interpret the results. Because you will be using The Major Arcana on several occasions, it is advised to record on paper, or on your computer, each Card drawn so that you can begin to see Your Past Life begin to take shape before you. Do not try to hold all this information in your head as it will be impossible to analyse or remember. Move Slowly and do not try to rush The Reading. You will have to Mull over all the Cards drawn. If you are unsure about what Cards mean, then go to the Section that Lists all the Cards by clicking here. The Sample Lists and Interpretations given in Past Life Tarot Reading Part Ican be found by clicking on the link. The 16 Court Cards – In one complete Deck. Each time they are used, all Cards should Cleansed and returned to their Upright Position before Shuffling. You will be Reversing some Cards again but you want a Clear Deck each time to start from . My Sample Past Life Reading Part II can be found by scrolling to the bottom of Page. Please Read all details below first before going to Sample Past Life Reading Part II. 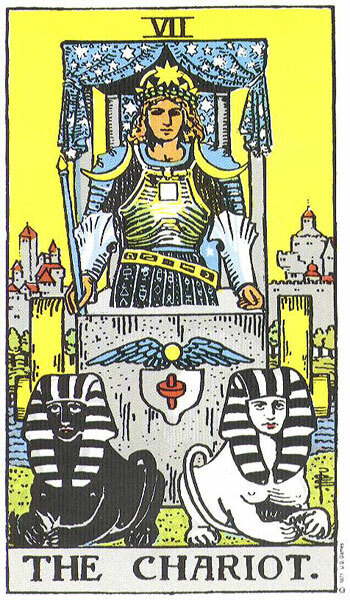 Now let us continue where we left off in our Past Life Tarot Reading Part I. Below is the layout from the first part of The Past Life Tarot Reading. If you are viewing this for the first time, then please go back and Read Past Life Tarot Reading I to get the story so far. Remember, this is only a Sample Reading based on a Reading I have done for myself with the specific intention that it be for study and practice purpose. My subconscious has supplied me with this information and it may be quite dramatic so that teaching it might be more interesting. Intention means everything when we want to work on any level as a Reader, Healer, Psychic or Medium. Unless your Intention is Clear and Precise, the information you receive back may be muddy, confused and unclear. I will not take to heart too much from this particular Reading as I did set the intention for it to be for Teaching Purposes. It is also running a similar theme to the fictional story I have been writing about The Knight of Wands so who knows where it is all coming from. It is exciting though and very dramatic. However, it is rather eye-opening, and it would be wonderful to think that I was this warrior person in a previous life. As with Part I of this Reading, I have supplied a Sample Reading below so that you can see how I have set about Interpreting the Cards I have drawn. You do not have to stick rigidly to my format. Work with whatever suits you. Also, remember this is for fun, for interest and to help you learn to read The Tarot more effectively. *Do not take the information in these Past Life Readings too seriously, or dramatically alter your current life based on the information given unless it is truly for your highest good. Instead, dwell or meditate on the information and see if there are any common threads, themes or personalities in your Current Life and make some comparisons. You might be surprised what you learn about yourself in the process. I have shuffled The Major Arcana and Reversed some. I want to know the deeper issues behind my apparent lack of success. I will then examine the Events that led up to it. In advance of shuffling I set the intention that I will be Drawing Two Cards and that I will take The Top Card and The Bottom Card as my Cards. Therefore my subconscious knows what to do, and is seeking on that basis. We hopefully are all singing from the same Hymn Sheet. To get information on the Events, The Four Suits will each be shuffled individually, Wands, Cups, Swords and Pentacles. All Cleared of previous Questions and all Upright before Shuffling. Reverse some in the shuffling. You will be taking the Top and Bottom Card from each Suit. Lay them out as depicted in My Sample Reading below. To Determine Personality Aspects involved in the Specific Events For Each Suit, Shuffle the complete set of Court Cards, Reversing some as you go. Select One and lay it beside the Suit you have just drawn from. 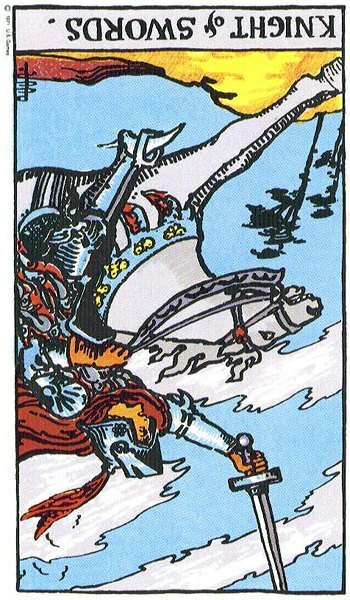 To discover The Driving Force behind Specific Events as detailed in the Suit Cards, Shuffle the complete Deck of 22 Major Arcana Cards, Reversing some as you go. Take the Top Card and lay it beside the Court Card just drawn. You should have Two Suit Cards, a Court Card and a Major Arcana Card in a line. *Make notes of any observations, interpretations, theories and concepts. You will be doing the same for Each of The Four Suits so will need to put whichever Court and Major Arcana Card drawn back in their Decks as you will be re-using these Decks for each Suit. When you are finished you should have Four Lines of Four Cards. Make sure to make your notes for each Suit Event as you will get mixed up if you try to remember too much. Examine the notes I have made in My Sample Reading for ideas on how these Cards may be interpreted. Shuffle the entire Deck of Cleansed and Upright Major Arcana. Draw One Card and take notes. Meditate on this Card for a while and see how much meaning it has for you. Are there any comparisons between the two lives? What might you have learned in that Life-Time that you are using to your benefit in this Life-Time? Do the Same with The 22 Major Arcana as above and select one Card. Make sure to Reverse some Cards as you go. Observe Card closely and meditate on its implications to you and your life. Does it mean anything to you? Take notes. 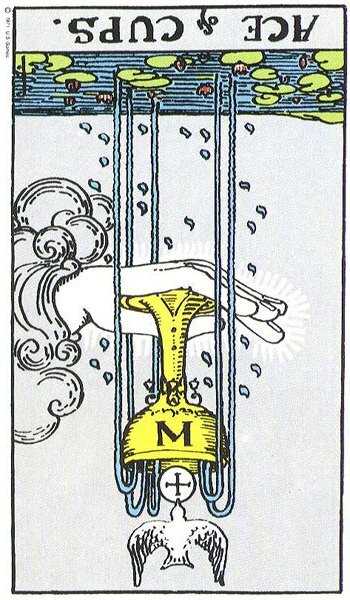 Do the Same with The 22 Major Arcana as above but select Two Cards this time, the top and the bottom Card. Make sure to Reverse some Cards as you go. Observe Cards closely and meditate on their implications to you and your life. Do they mean anything to you? Take notes. 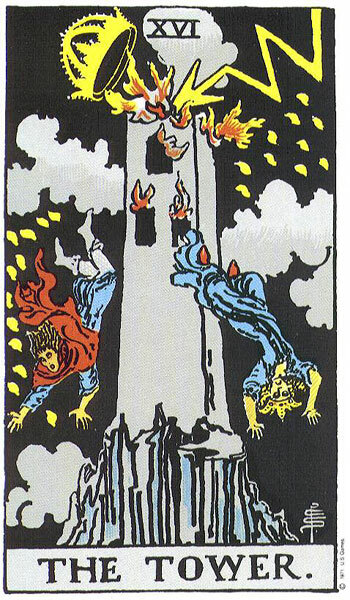 Do the same as above with The 22 Major Arcana Cards and select Two Cards again, the top and bottom Card. Meditate on these Cards. Do they make sense to you? Do you feel an affinity with them or are you struggling to comprehend their implications? The First Card deals with your Soul Purpose while the Second Card deals with how well you are advancing towards it. If the Second Card is Reversed you may be dealing with some strong blocks. Do the same as above with The 22 Major Arcana Cards and select Two Cards again, the top and bottom Card. It is especially important to Reverse some Cards as you go. Meditate on these Cards. The combination of these Two Cards deal with blocks and challenges you may be facing in achieving your Soul Purpose. If both Cards are Reversed you may be dealing with some strong blocks. These Cards will also give constructive advice on how to overcome any blocks. Take notes. Shuffle all 16 Court Cards. Reverse some as you go. Select One. Analyse their personality. You may recognise someone you know, or it may just be a personality type you find challenging in all avenues of life. Anything or anyone we find challenging in our Life-Time usually have Lessons to teach us and we should pay close attention to what they might be. Why does a particular personality type annoy or irritate you? Why is it that you dislike a particular person? What is it about them? Shuffle all 16 Court Cards. Reverse some as you go. Reversed Personalities may have a role to play in helping you to be successful, so do not be surprised if you draw one. Select One. Analyse this personality as above. You may recognise someone you know, or it may just be a personality type that makes you work harder or expects a lot from you. It may be someone in particular, or a personality type you find friendly and are drawn to. In what way is this person or personality helping you to succeed? Take notes. Now read through your notes and make further notes on any observations you have after the review. You will have found that throughout the Reading you have been making connections between Cards and Previous Cards so that a story-line has formed. It is vitally important to make notes, as I have done below. It is also important to take your time while doing this Reading. This Past Life Reading Part I and II is excellent for using as a Distant Reading for a client, with you acting as surrogate when Drawing the Cards. In a Distant Reading, you can take your time and make the connections before typing up a full report for your client. They can then add their own observations after receiving it. 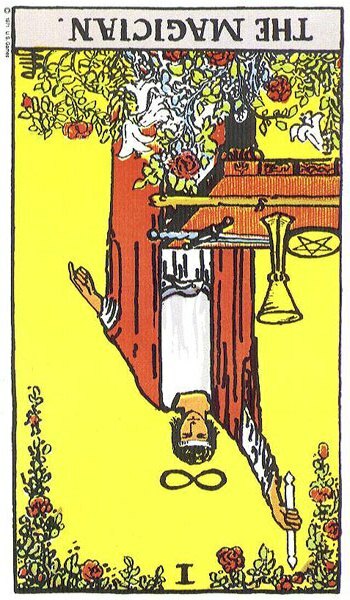 *Remember, Past Life Tarot Readings should be treated as an interesting line of investigation only, and not taken for true facts or actual events. Often the Subconscious throws us a fictional story-line. It may not be factual, but will very likely mirror some actual issues and challenges that one is, or has faced in the past. It should be used on a constructive basis for moving forward in life and not for dwelling or living in the past. What Blocked Me From Achieving my Soul Purpose in That Life-Time? 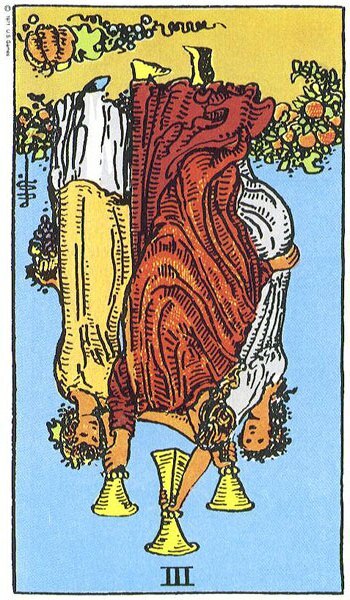 I Draw the Reversed Fool (0) and Reversed Temperance (XIV). Now this is tying in with what my suspicions were regarding the Latter Stages Reading for The Pentacles and Wands. The Reversed Fool tells me I took a risk, a typical knee-jerk Wands reaction reckless risk. I acted Foolhardy. I didn’t listen to good advice or never sought it in the first place. I moved too hastily, acted without thinking, took a chance that was doomed to fail. I did something stupid and put others (Ten of Pentacles Reversed), my family at risk? Because this is The Fool Reversed, I feel something may have happened that caused me to regress back to a childlike way of behaviour. Deep repressed issues from my childhood may have been unleashed due to an incident of some sort. I was heading for a fall and I doubt anyone could stop me. Temperance Reversed tells me that my timing was off and my behaviour inappropriate for what was needed. I lost balance and control and acted impulsively and recklessly, but why, what happened? I acted without thought of what the consequences would be. To me Temperence Reversed suggests extreme behaviour and not learning from mistakes of the past. I was thinking of myself and not thinking of the greater good of all. I instigated more trouble, brought conflict to our door when I had the power to bring healing instead. I lost total control and maybe the support of those around me who would have viewed me as a loose cannon. Wands – Wow, this looks very nasty. 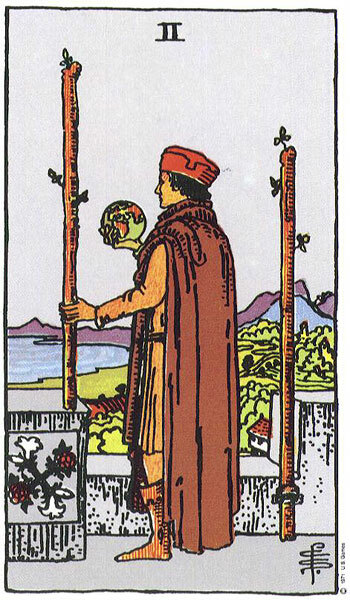 First off impressions are, Three of Wands – a Foreigner, someone from overseas or watching ships sail in. Are they battle ships? 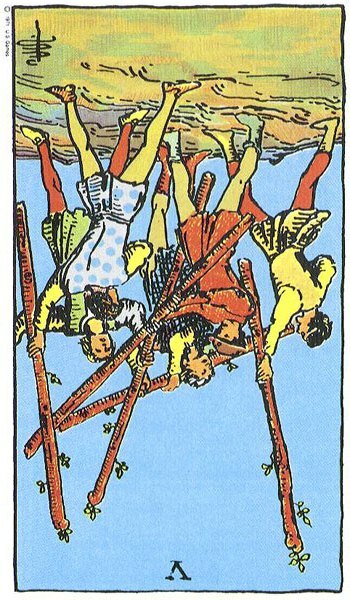 There is a battle scene in The Reversed Five of Wands. 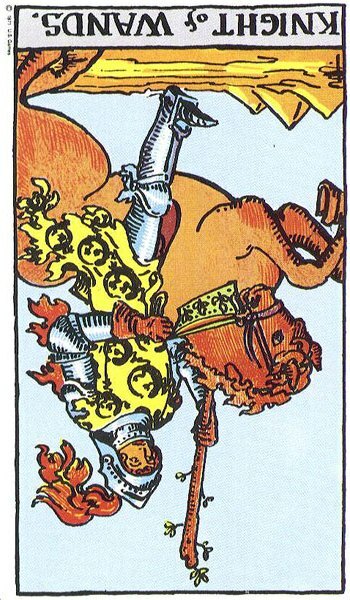 As Reversed Cards can imply extremes, I can only assume with the Reversed King of Pentacles and Devil sitting the otherside that the battle is fierce and bloody. Trouble coming from abroad? Invasion possibly? 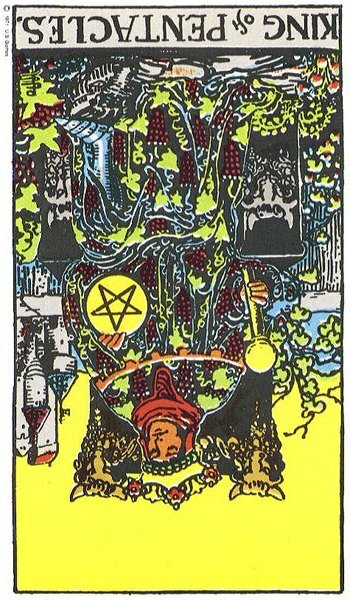 The King of Pentacles Reversed is very powerful, possibly very wealthy, but is unscrupulous and ruthless as to how he gets his money. With a Reversed Pentacle Personality here, I am going to run with a Powerful, Corrupt, Ruthless Leader who is also Greedy. He wants more, he wants it all, he wants supreme power. The Devil tells us all this and more. 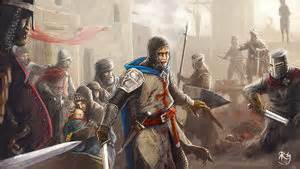 Here is a conqueror, crusader who wishes to seize territory, assets, wealth and total control. He doesn’t care how he goes about it either. This is exactly what the Principled Knight and King of Wands would have fought against. This is the very abhorrent enemy they would have been determined to keep at bay, and would have forged allegiances against. 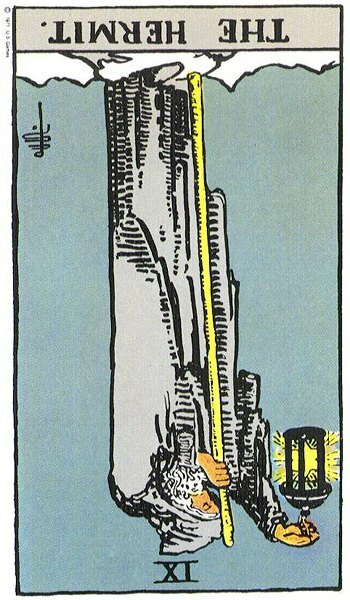 Somehow, they have managed to get through, they have arrived and I feel the King of Wands may not have been prepared for them. 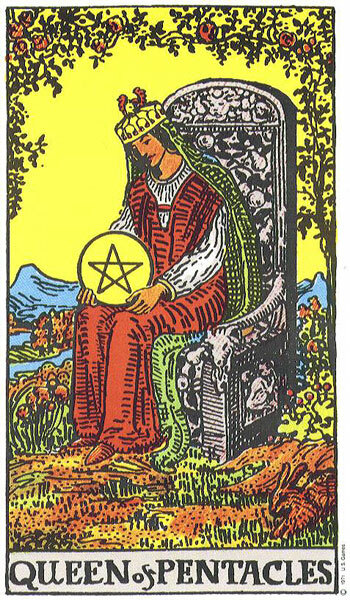 Possibly with The Reversed King of Pentacles and The Devil involved, dirty tactics would have been used. Cups – Here we have the Reversed Three of Cups turning up again and I am overwhelmed by the story that is beginning to unfold here. 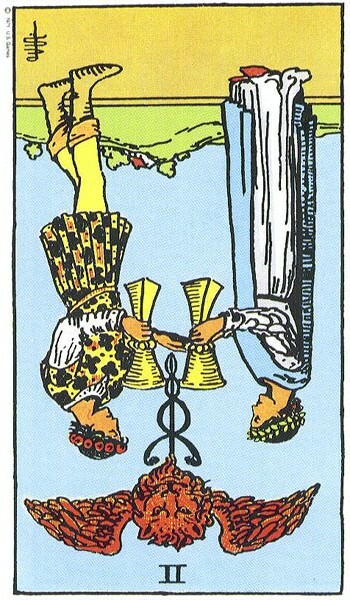 I spoke in Part I about the possibility with The Three of Cups being Reversed towards the Latter Stage of the Past Life that it may have suggested a lack of support and friends. I also spoke of enemies disguised as friends and possibly sitting at this very table. With The Reversed Page of Swords appearing next to The Reversed Magician I smell treason and treachery. I sense a spy in The Reversed Page of Swords, someone very cunning with ears everywhere and underhand behaviour. 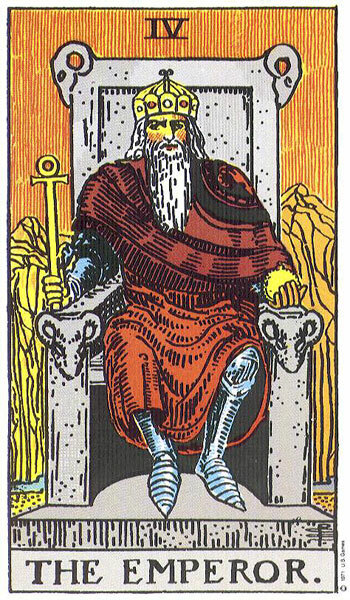 The Magician Reversed speaks of immense Power but used for Negative Purposes. I sense a mercenary, and definitely so-called friends who could not be trusted. The Magician Reversed is the Trickster, The Illusionist, The Con-man. 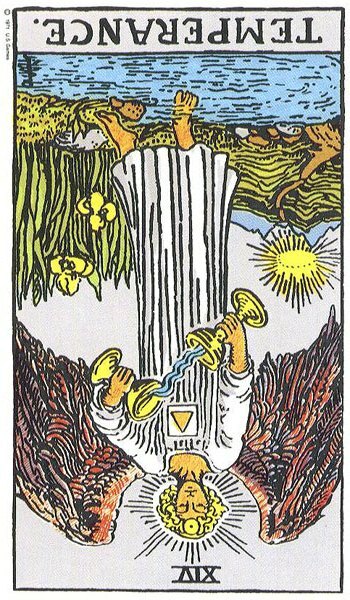 He fooled the King of Wands, and maybe The Reversed Fool in the Reasons behind Not Achieving Soul Purpose also carries this aspect. 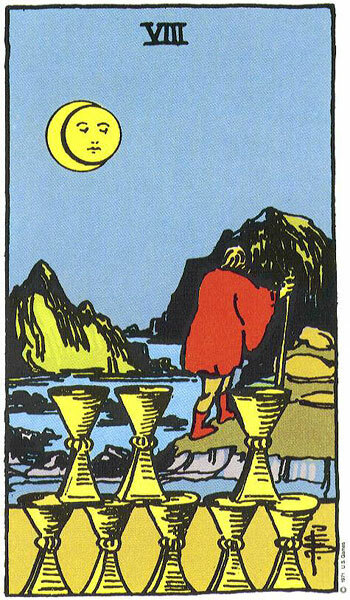 In the Five of Cups Reversed we see dreadful disillusionment, upset, disappointment and deep, deep anger. Blood will be spilled and it looks like some may have been already after the discovery. 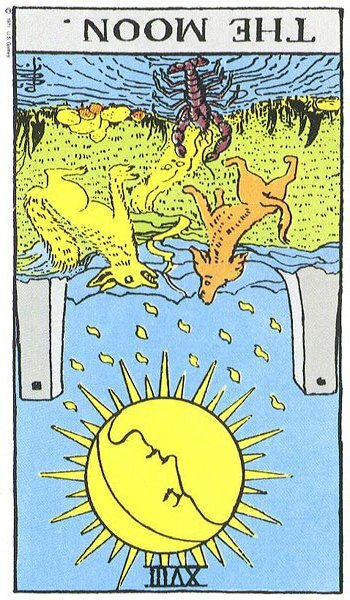 The river beside the figure in The Reversed Five of Cups will run red with blood. I believe the Driving Force is building here. 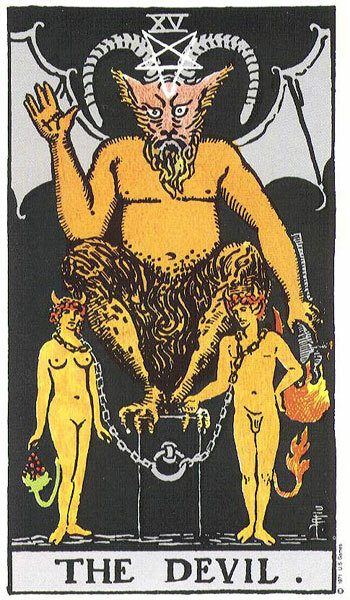 We have a very powerful enemy in The Reversed King of Pentacles, The Devil and The Reversed Magician. This is not going to have a happy ending. 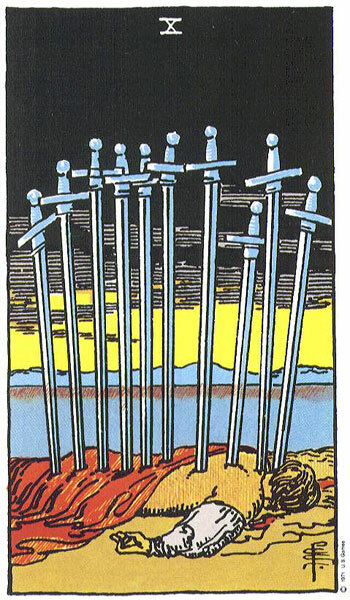 Swords – I quickly take in the situation here as it is building from the previous Cards and also the Cards of Part I. 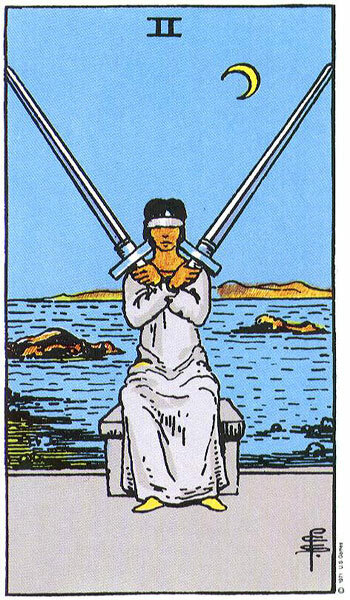 We have seen The Four of Swords as the Latter Stage of the Past Life on Swords Level. Now we have The Ten of Swords appearing. Both suggest possible injuries, attack, passing over. 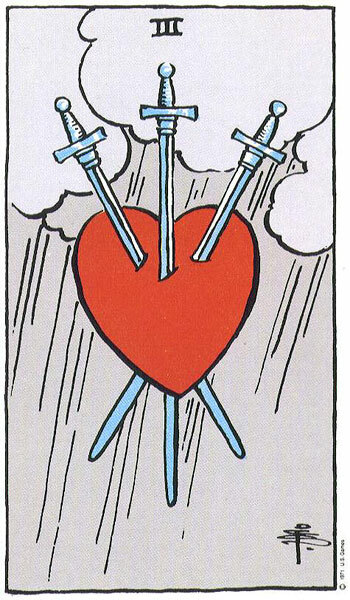 The Four of Swords maybe confirming the same story that we are now seeing in The Ten of Swords but they may be separate issues or events or connected to different people. 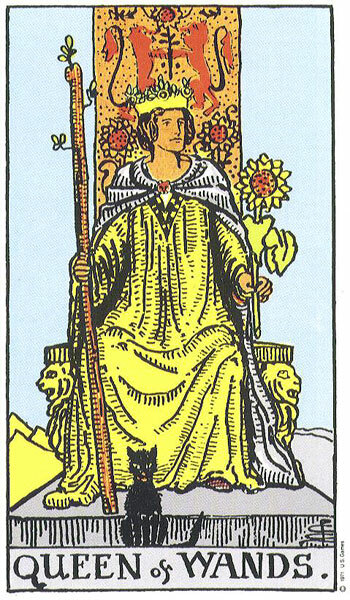 We have also seen The Queen of Wands before as The Mother Figure of The Knight of Wands. 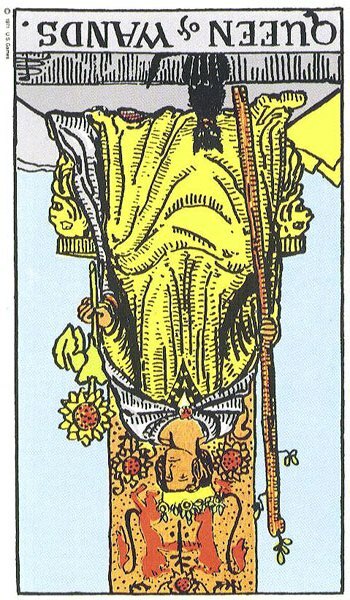 She is still Upright so we can assume she is not the Partner (Reversed Queen of Wands), we also saw in Part I. 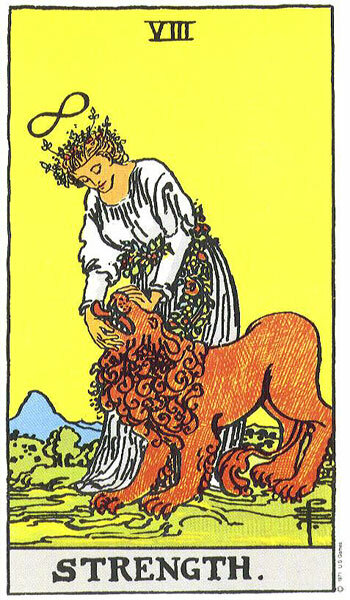 The Queen of Wands has remained strong and loyal throughout but I do not like what I am seeing. 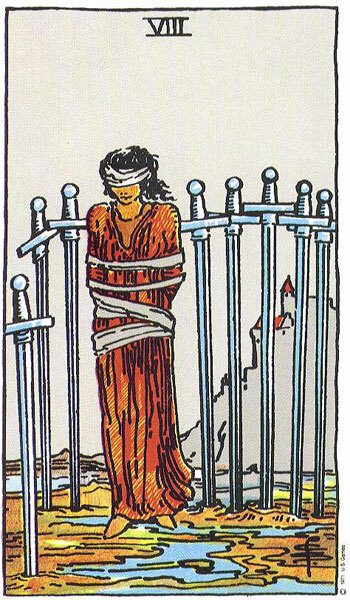 Instead of the positive Cards she should be surrounded by, we have her connected to The Ten of Swords which does not bode well for her safety. 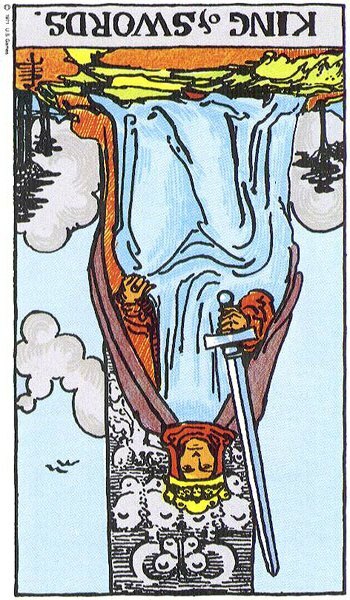 This layout of Cards for me suggests that The Queen of Wands, The Mother Figure was captured and taken prisoner. 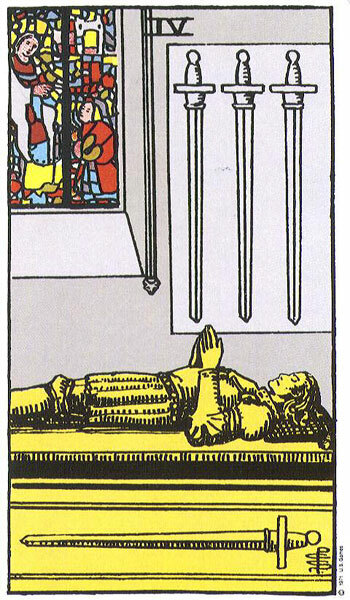 I believe she was killed or executed in The Ten of Swords as we have Death sitting the other side of her. However, Death may also symbolise the end of a way of life, the end of power. 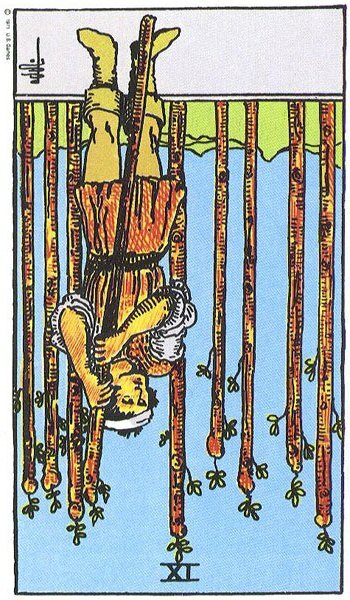 This is quite shocking to discover and already I am beginning to understand why The King of Wands may have lost control, lost his balance and sense of reason. It may give us the reasons, for right or wrong, as to why he lost his head and reacted in a reckless manner. It had all become very personal and this would certainly be enough to make him go insane with rage. He has been betrayed by those he thought to be his own people but they all were just power-hungry and were in the paid service of a brutal force that was coming from far away to take away everything The King of Wands had worked so hard to build. 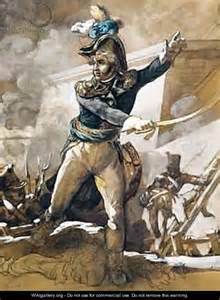 He would certainly not go out, down, or surrender without a battle. He would die first, but would he expose everyone else to horror just for a personal revenge? He was ruler and leader. Could he rise above what had happened and think of the consequences for his people? 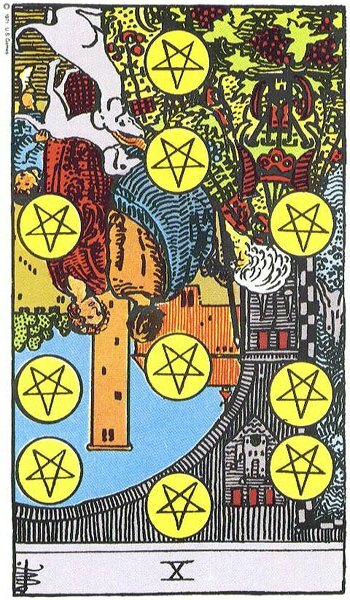 Pentacles – Ah, the downfall, the ruin, the horror. And so we see the consequences of all the previous Events. 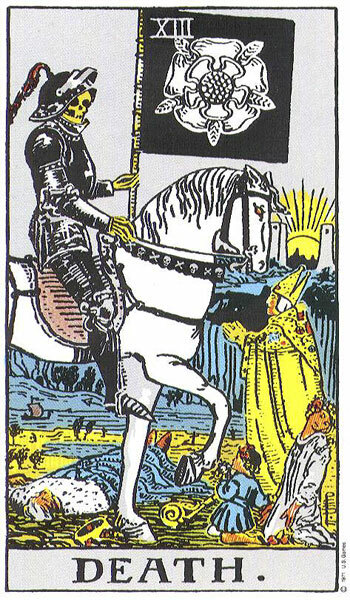 From the dedicated and conscientious work of The Knight and King of Wands we find the Reversed Knight of Swords hell-bent on Revenge. He has taken flight and is baying for blood. Without care or thought for anyone else involved, he runs amok and I believe seeks to punish all and blames all. We have catastrophe in The Tower with homes being burned to the ground and people flung to their death. Those that survive are left to roam the streets, injured, homeless and bereft. Instead of gathering whatever forces he had to stand up to the enemy, he let personal revenge take over. 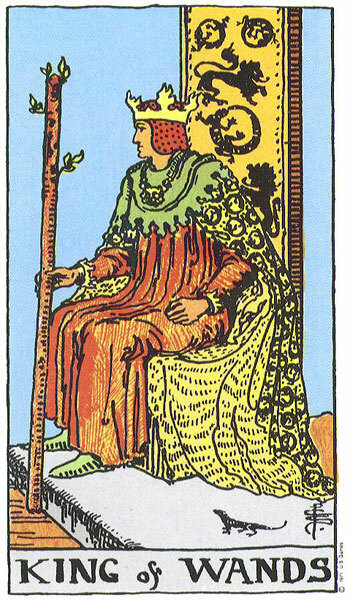 The Reversed King of Pentacles just walked in, and in one swift movement took everything that he had worked so hard to establish. 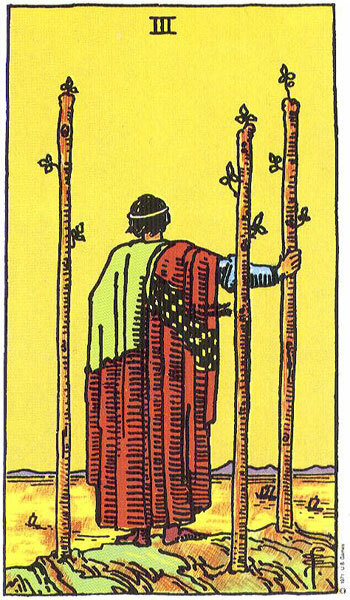 Should he have remained The King of Wands Upright, he would have found a way. The people would have got behind him and he could have rallied support, but instead he flipped into The Reversed King of Swords, turning sour, bitter and every bit as ugly as who he was trying to defeat. He lost it at the very end and immaturely reacted as The Knight of Swords Reversed. He was probably killed too by the very same Sword that took his mother’s life. He gained nothing, and failed to do what he was sent here to do. To be a powerful, strong, just and protective Leader. Both The Reversed King of Pentacles and The Reversed King of Swords ended up with blood on their hands. Strength – Now this is particularly easy and makes perfect sense. There is more than one way to show strength and power. It does not always have to be forceful. Inner Strength and the Strength to be able to deal with difficult and traumatic situations in a controlled manner instead of being explosive and aggressive. Finding a diplomatic or peaceful solution is better than attack. To be able to keep my cool and find the courage to survive all that life throws my way. To not give up when the going gets tough. To find and acknowledge my particular strengths in this Life Time. To be strong for others and stand up for what I believe in. 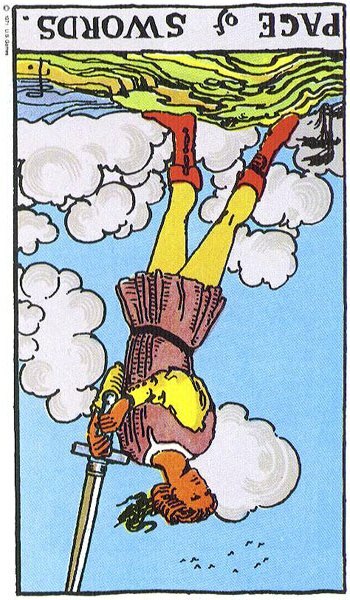 The Fool Reversed – Here we have him popping up again. I believe that this is quite simple really. What I need to work on is to understand the difference between the benefits of being spontaneous, taking the odd risk, taking a chance and being foolish and reckless. I need to know that it is okay to trust my gut instincts at times and just go for it, but that at other times maybe others do know better, and I should listen to them or move cautiously. I also have to learn to take into consideration how I might affect others by any impulsive or spontaneous actions I decide to take. There is also a time and place for being carefree and self-indulgent, and that is not every day. 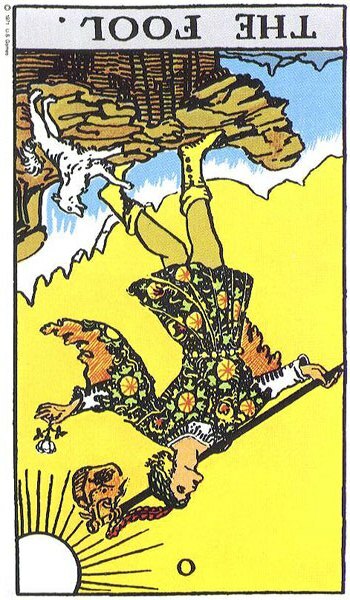 The Fool Reversed also implies that I am working on some childhood issues from my previous life. This Life-Time is certainly the time to deal with them and move on. 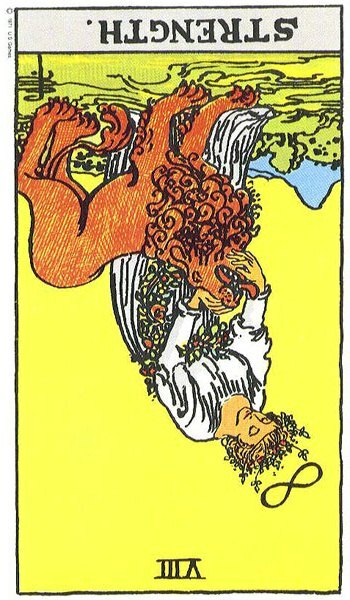 Strength Reversed and The Hermit Reversed – Yes, both these Cards suggest that if I had that life time to live again, I would have used my inner-strength, my Wands,Lion Heart Strength to overcome the Events that shaped the end of my life. I would not have given into knee-jerk reactions and let loose the wild aggressive side of my nature. I should have found another way. 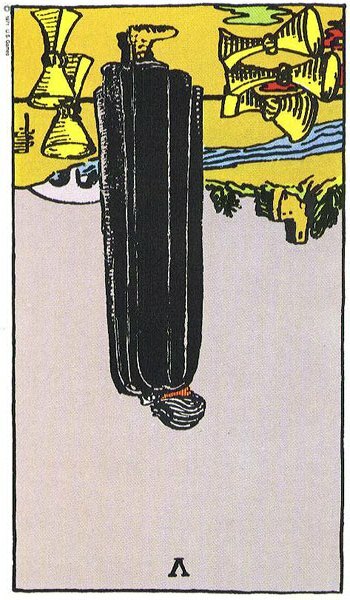 The Hermit Reversed re-enforces this by showing how much I regretted not taking the time out to think things through properly. 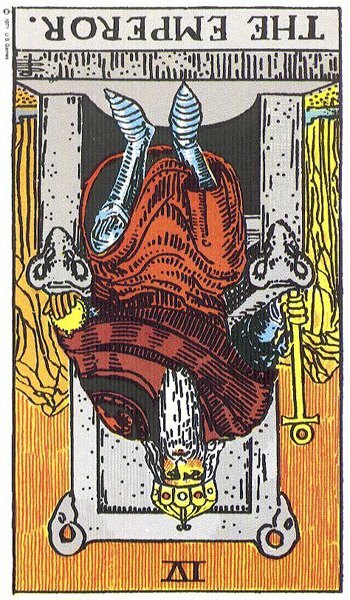 The Hermit’s way of doing or thinking about things would have been boring and much too slow for The Knight or King of Wands. If they had spent more time reflecting on their situations instead of just constantly acting on them, they would have become much wiser. They would also have been able to spot the difference between those who were genuine friends and those who were not. I also feel The Hermit Reversed suggests that I may have avoided seeking counsel from those who would have suggested I calm down and wait, or that I failed to listen to warnings that were issued to me by well-meaning people. I put my trust in the wrong people. The Star and The Empress – How lovely. What a wonderful respite from battle and external power. With The Star I am here to do many things, but I am clear I understand her presence. I must develop my inner-power, release my creative potential and express it for all to see. I must not be content with just discovering and working with my talents, but I must also be prepared to share them around. What inner-power and knowledge I have is not just for my benefit. 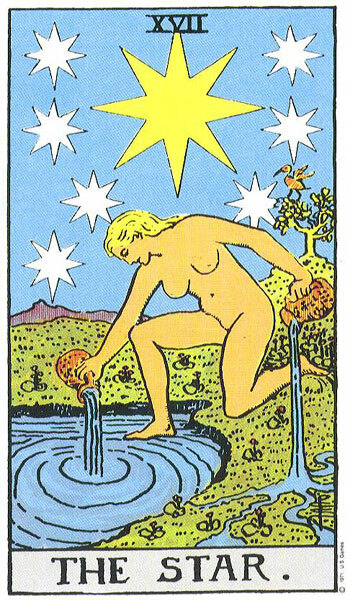 The Star is a Humanitarian Card and so my talents must be used for the good of others and not just myself. I must not be afraid to be myself or fear success. I must let my Star Shine and follow my Star. 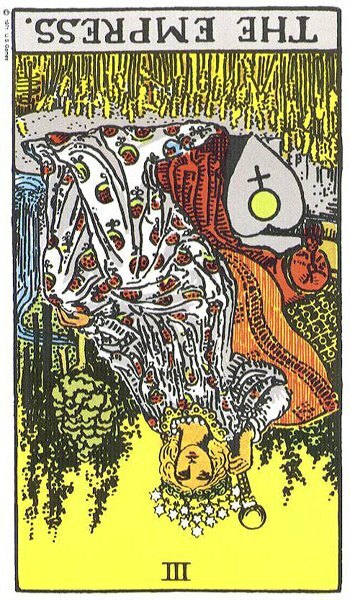 This Card acknowledges that I am dipping into ancient wisdom, that of The Collective Unconsciousness, that vast pool of knowledge where all inspiration flows from. However, I am also contributing to it so that others over time, centuries and other Life-Times may also have access to that which has flown in from me. I must add to what is there for the better of mankind. I must only add that which is positive and constructive. I must be free or free myself within this Life-Time to do that which I desire most and to be true to myself. My work must be a true reflection of myself and I must wear no masks or facades. 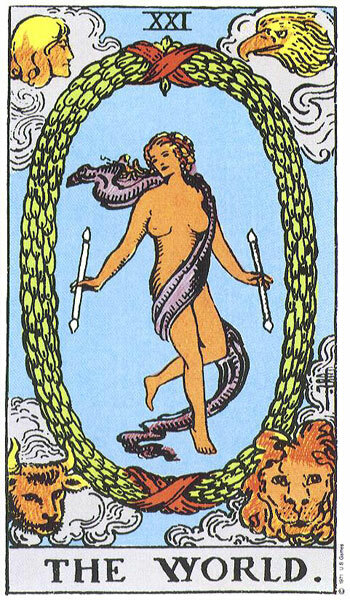 The Empress in answer to how well I am advancing with my Soul Purpose in this Life-Time is very reassuring for she smiles back at me that everything is growing in her garden, and that I am very productive where I need to be. All is proceeding nicely and coming towards maturity. 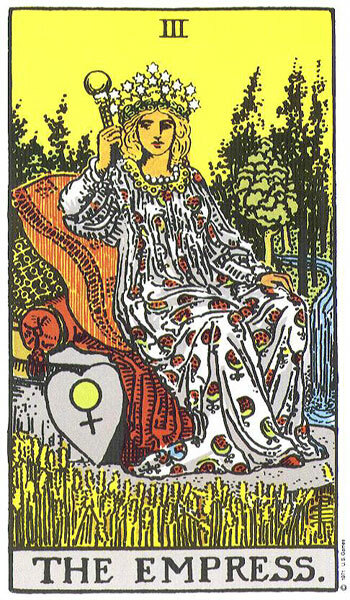 She also speaks of giving birth to new aspects of myself and The Empress is another Card for Creative Expression. She encourages me to Sing (I have recently started having my voice trained) and also to develop my home-crafts (I started making vintage dolls in the last two years). She tells me that all aspects of my creativity have to be involved and not just one. She asks me to look at The Star and not to just acknowledge the central main Star, for I have many others circling in the background. However, The Empress understands that even she can become over-productive, and reminds me that I must make time for myself so that I can relax and take care of my own needs too. 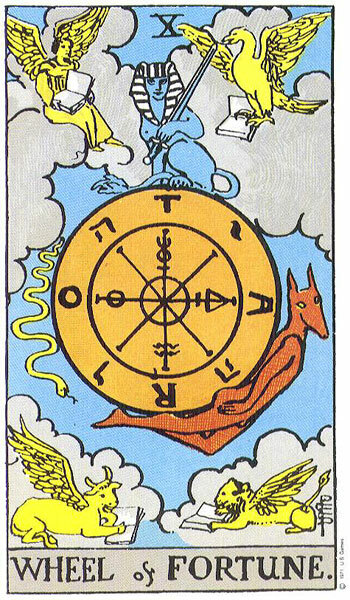 The Moon Reversed and The Wheel of Forturne – Well I have to laugh at this because I am always being told it by friends and family members. I have a deep-rooted fear of success. The deep-rooted fear is shown in The Reversed Moon. Those old demons crawling out of the quagmire. That the fear being related to success is nicely highlighted by the presence of The Wheel of Fortune. This is a subconscious thing and one that is hard to overcome. It will make me fearful about taking a chance or risk for fear that it may fail. This also brings in The Reversed Fool from earlier. Knowing when to take a chance and when not to. One must do one or the other and be confident about the decision otherwise one gets stuck. The Wheel of Fortune is Upright telling me that I have to think positively. If I believe something will fail then it will, and all that does is confirm my fears. I will draw to me that which I dwell on and my biggest challenge is to believe that all will work out in the end. If I am not in then I can’t win. I am in control of my own success, even though some luck is always involved in it. I will have to develop a mantra to overcome my fears for these Cards are telling me they will be my downfall if I give them total power. Who is here to challenge me? Who in This Life Time is here to Help Me Succeed? The Knight of Wands Reversed and The Queen of Pentacles. 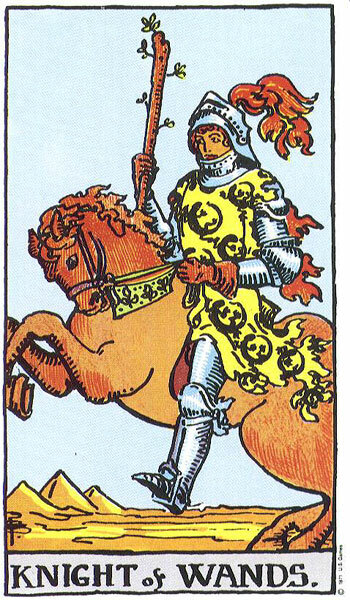 The Knight of Wands Reversed represents those who wish to rush me all the time. Those who cannot understand what I am doing, think that I should produce results overnight. Those who get impatient with what I am doing and want me to cut corners and not be so meticulous. The Queen of Pentacles represents those who believe that sometimes one has to wait and be prepared to work very hard to get what they want. Those who back me up in my attention to detail and being methodical and thorough. Those who understand that there must be personal pride in what one does and not just material gain. 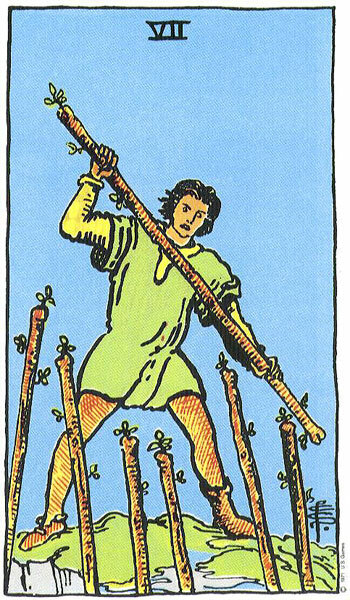 If it takes longer than The Reversed Knight of Wands thinks it should, then so be it for I will not be rushed. 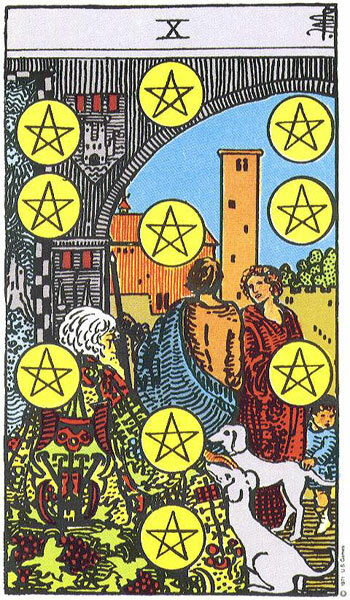 “The Star and The Empress” suits you so well , the way you word your experience with tarot and the amazing insight (deptj) you can give is something you need to share with the world , also for some reason I always found the 9 of pentacles card reminding me of you , not in a ‘money’ way.. Sorry haven’t yet got to reply to your other mail in full but will in time. A lot on my plate at the moment and you do ask a lot of questions!!! However, I would like to thank you for your wonderful comments above and know that they are very much appreciated. I wouldn’t have been able to keep up the level and volume of writing I do if it was not for the likes of you and others who have supported me throughout. Thank you again. 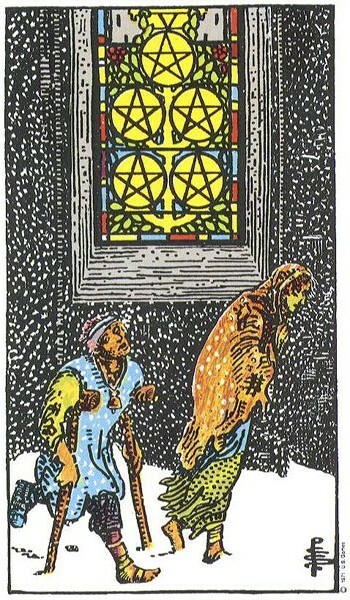 So, the Nine of Pentacles Card reminds you of me? Well I am a Pentacle and also female and sadly no longer in my youth. I do live in countryside too and am an animal and nature lover. I like good clothes, antiques, fine wines and luxuries if I could afford them. 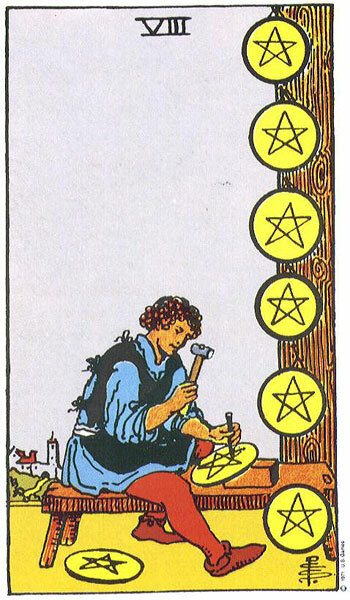 However, I wish I had the remaining Nine of Pentacles qualities, like financial stability and time on my hands to enjoy life’s little luxuries. I still haven’t reach that stage where all I have to do is walk around admiring the garden, smelling the roses and checking my bank balance. One day maybe.